From exclusive tastings to the chance to sample rare drams, joining a private club has clear benefits and can be a great way to enhance your whisky experience. But which one to choose? Jake Emen reports. Membership has its perks, as the saying goes. It’s not just about gold cards and elite status, either. When it comes to whisky, it’s about capitalising on special opportunities, ranging from exclusive tastings and rare drams to coveted seats in tiny but popular settings, and all kinds of added fringe benefits. Such private clubs and memberships have spread across the US too, providing thirsty imbibers with a number of exciting options. Here’s where to go and what to sign up for to maximise your access. Multnomah’s membership comes at an annual rate of US$600 per person, and is in such high demand that it’s entirely filled up – you’ll have to join the waiting list just to earn the right to pay for your membership right now. Once you are a dues-paying member, though, you’ll be able to reserve a seating space in the library room during normal hours – which is a near-impossible task otherwise – while gaining access to members-only events and priority access to non-member events. You’ll also receive a set of custom glassware and special purchasing opportunities. Non-members can buy a ‘hall pass’ for $25 per person, providing a one-time seated reservation. The Cocktail Club may be focused on, well, cocktails, but there’s also an extensive whisky line-up available. VIP membership at The Cocktail Club Charleston comes at two different levels: silver members pay $250, get to skip lines and attend members-only parties, while receiving a free annual cocktail class, couch reservations, admittance to one private spirits tasting, and 50% off during daily, three-hour-long happy hours. Gold members pay $500 for all of the above, plus a free room rental twice per year, the ability to bring up to five guests at any time, and a $100 birthday month bar tab. The Manhattan Cricket Club is designed as a social club, with members receiving invitations to special events and tastings, such as distiller-led seminars, as well as ownership of private lockers (see below). The whisky selection is diverse, with an emphasis on premium pours, from old Glenrothes vintages to Balvenie 30 Year Old and Bowmore 25 Year Old. You’ll also gain the ability to make reservations in the club, along with priority seating, and access to speciality menus. Priority is given to those who have been referred or nominated by existing members, with membership costing $750 per year. The Wingtip Club isn’t a membership offshoot of a larger bar; the entire space is a private club loaded with unique amenities. There’s a 2,000-bottle wine cave, private parlour rooms stylised with different décor, from the swanky velvet room to the college clubhouse cotton room, and the classic tweed room, befitting of a well-aged single malt. There’s also a billiards room and a golf simulator, all in addition to the main bar and lounge area. Most importantly for you, there’s the whisky corner, with a line-up of more than 500 whiskies from around the globe. Membership is capped at a total of 1,200 people, with Wingtip expecting to be full by the end of the year. The two main levels of membership include the ‘social’ level – six visits per quarter with a $2,000 initiation fee and $125 in monthly dues – and the ‘regular’ membership, offering unlimited access with a $3,000 initiation fee and $200 in monthly dues. Visiting memberships are designed for out-of-town guests, with a one-time $1,000 fee and $25 in monthly dues, offering five visits per year. All members receive invitations to annual events, including a Sinatra holiday party in December and a springtime bash in homage to Ian Fleming’s birthday. While the Scotch Malt Whisky Society (SMWS) doesn’t have any dedicated venues in the US like its flagship outposts in Edinburgh and London, it does have a line-up of partner bars from coast to coast. There’s more than a dozen bars offering a selection of the latest single cask picks from SMWS. While anyone at these bars can order those whiskies, members receive a discount on pricing when they do so. Each partner bar generally also hosts special SMWS events and tastings occasionally throughout the year. 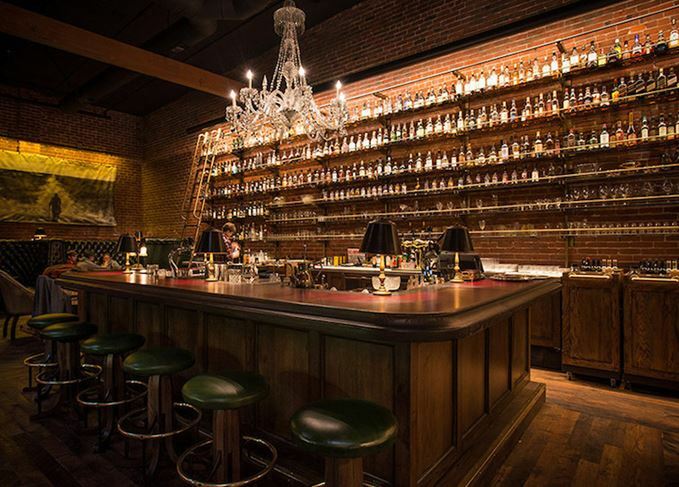 In San Francisco, Elixir (3200 16th St.; elixirsf.com) hosts a weekly cocktail club with free tastings hosted by master distillers and other experts, and discounted drink specials. The bar carries more than 450 whiskies of all varieties, including a line-up of private barrel selections. Seven Grand (sevengrandbars.com), with locations in Los Angeles, San Diego and Austin, has a Whiskey Society which hosts special events, educational seminars and weekly tastings. Joining the society is free, and you’ll be notified of upcoming opportunities, though you then pay $15-25 when you choose to attend given events. Whisky lockers and bottle keep programmes are also becoming more popular and widespread, and are akin to private memberships in their own way. The specifics of the operation vary from place to place, but generally you buy and store full bottles of whisky and other spirits, and then you and your guests can enjoy pours from your personal wares. Some bars may also offer additional discounts and incentives, and some may maintain a minimum purchase requirement to keep your locker operational. A few places to stash your booze so you’re always drinking well as you travel across the US include The Flatiron Room and Fine & Rare in New York, both offering monster whisky line-ups and live jazz; The Franklin Room in Chicago; neighborhood go-to Ivy & Coney in Washington, DC; and two of the aforementioned bars as well: Seven Grand and Manhattan Cricket Club. Charting the ‘special relationship’ between the White House and whisky as the latest election looms. Diageo plans to print nutritional information on bottles of whisky in the US.